Bernie has commented on his site about his feelings playing with Whitesnake again, and the events leading up to this. Here is part of the report, and you can read it in full on his website. David Coverdale called me after Christmas and invited me to play with him and the band at the Sweden Rock festival. I of course was delighted to accept, David and I have rebuilt our relationship over the last couple of years, all because of a chance meeting at London Airport in 2009. I was flying to Italy and Whitesnake were on route to Prague for a festival show. We spent an hour in Starbucks, simply chatting and enquiring about families and state of the business kind of thing. The gig in Sweden was terrific, I played four songs, Fool For Your Loving, Ain’t No Love In The Heart Of The City, and Here I Go Again, the audience response was incredible, we all returned for “Still Of The Night”, alongside another former Snake guitarist, the flying Dutchman Adrian Vandenberg, so we had four guitarists (with) Doug Aldridge and Reb Beach. We travelled back to Copenhagen after the show, about a three hour drive on the tour bus, well things have changed since my overnight tour bus days, the luxury on board was great! I spent a long time chatting with the great Doug Aldridge, he is a big fan of the original band and has a deep respect for the music, he played with the late Ronnie Dio, we both fondly remembered the man. David Coverdale then asked if I would like to play at the Hammersmith Apollo with the band 20 June. Well, to say I was happy, I was a little emotional after the call, I expected to be the same in Sweden but I was so excited and the guys made me feel so welcome, all the crew, back stage people, drivers, I had no time to do anything but play. The personal reasons for Hammersmith poured out of me, in the days of the original band we dreamed of playing there for one night only, let alone eight, we were the kings of the gig then called the Odeon, but since those days I have played there two or three times in ever declining circumstances, in fact after a show there with Lynyrd Skynyrd with the Company of Snakes I folded the band, so my memories of the great place were tarnished and I thought would stay that way. But now after a night of high emotion and great pleasure I can retire if I want too with my Hammersmith memories intact. David was very gracious introducing me from the wings for “Here I Go Again”, this time I had a large lump in my throat as I walked out, the roar was so loud I thought Nelson Mandela had walked on the other side and upstaged me. All this and I had Jimmy Page watching from the wings, no pressure then! And then it was over, but only for now I hope, the bridge is rebuilt, I have to thank Doug Aldridge here, without his encouragement and downright niceness this might not have happened, the band, and of course David Coverdale, a man totally in control of his destiny, he was and still is the guvnor’ on that stage, I watched him working, that is how to do it, I probably never noticed how good he was when we first did it night after night, being away and then so close made me realise what I have been missing, class will out; and attitude. 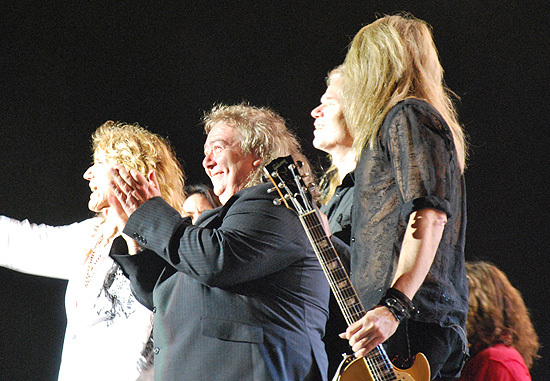 Bernie also played on the final Whitesnake show of the 2011/12 tour at the Wolves Civic. A massive cheer went up for the great man! I just found out he played here in a guitar shop a few months ago, never heard nothing about it! I hope Bernie gets a chance to write with David again and guest on a new Whitesnkake album.